Tip: Lines are light in the morning while most people are still in the Future World section of Epcot but build as the people start making their way over to the World Showcase area of the park. Try to arrive at least five minutes prior to the beginning of the scheduled meet-and-greet time as the line may close to new guests as they get close to the scheduled ending time. 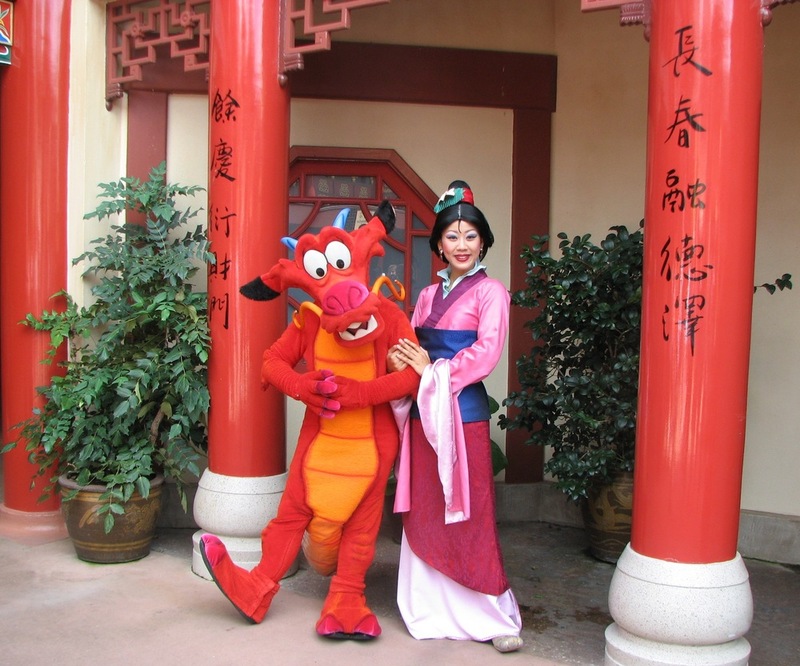 Tip #2: The Jeweled Dragon Acrobats also appear in the China Pavilion and are excellent so you may want to time your visit to allow you to see them and Mulan. Check your Epcot Times Guide for exact information during your visit. If you're interested in Chinese culture and scenery, you will enjoy the 13-minute Reflections of China 360-degree Circle-Vision movie shown in the Temple. Click here for more recommendations on visiting Epcot with young children. Trivia: Mulan was the first of three Disney Movies produced at the building that houses The Magic of Disney Animation back when Disney's Hollywood Studios had a working production studio. You can sometimes get a quick glimpse of Mulan among the characters on the Steamboat Willie boat in the finale of Fantasmic!, the evening show at Disney's Hollywood Studios. This show is offered most nights but check the Disney's Hollywood Studios Times Guide (available near the entrance with the park maps). Does wading through all the Disney World information on the internet make you feel like you're trying to breach the Great Wall of China? Our Disney-focused travel agents can give you a battle plan for breaking down the trip planning process into manageable pieces so you have a wonderful and memorable Disney World vacation. Photo credit: Top photo by Ashley via Flickr Creative Commons. Use the buttons below to search for other Disney Princesses by name or for all of the princesses available at a specific Disney World theme park. Click here to return to our main Disney Princess Page.